Available now on Steam and GOG. We've been following Ghost of a Tale for a few years now, and if you've seen it you'll understand why. HAVE you seen it? Just look at it, for heaven's sake, it's absolutely gorgeous. For too long GoaT has been a thing we look at rather than one we can actually play, but all that changed yesterday, as that's when the game hit Steam Early Access and GOG. 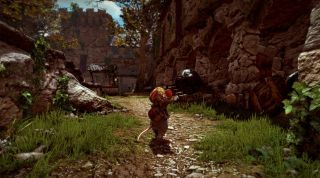 Developer SeithCG describes Ghost of a Tale as "an action RPG game in which you play as Tilo, a mouse and minstrel caught up in a perilous adventure. The game takes place in a medieval world populated only by animals, and puts an emphasis on immersion and exploration. It features stealth elements, disguises, conversations with allies and enemies, and quests". This early access version contains roughly the first quarter of the game, letting players explore the crumbling, medieval environment of Dwindling Heights Keep. SeithCG reckons the game will be in early access for around six months, and it's chosen to release it this way for a couple of reasons: feedback and money. "Although Ghost of a Tale is not yet complete," the developer states on the Steam Early Access page, "the game is at a point where we would benefit from a community of players exploring Dwindling Heights Keep, and giving us feedback (both technical and otherwise). "The second important point is obviously money. Back in 2013 the Indiegogo campaign raised roughly $40K of actual game budget. Microsoft helped us with a small advance on the Xbox One version but even that can’t keep us going for much longer. Putting the game on Early Access will allow us to complete the game (including localization) to our same high-quality standard while still remaining fully independent."